It turns out that in case of a fire in your home, a closed door is the best barrier against spreading smoke, heat and flames. But who’s going to run around the house shutting doors? LifeDoor is a simple gadget that sits on your doors’ hinges and closes them automatically (and gently) when smoke is detected. It’s kid safe and firefighter approved. 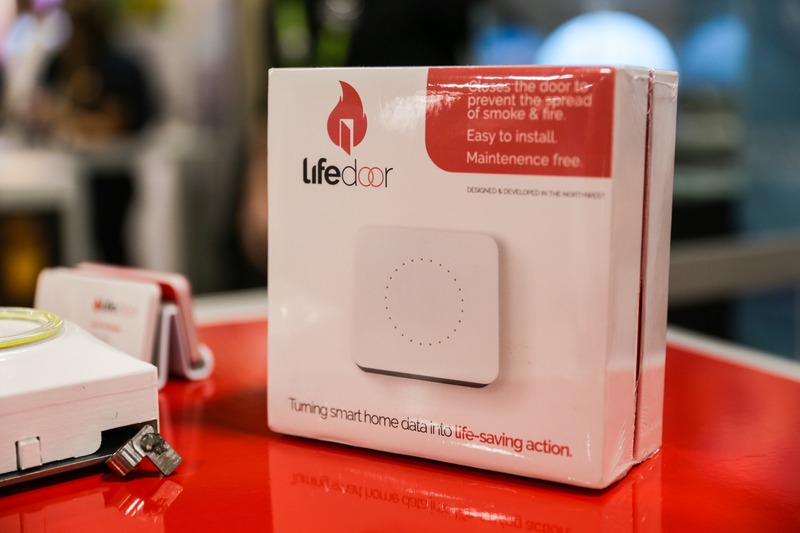 I talked with LifeDoor’s Ben Docksteader and Joel Sellinger on the show floor at CES, where they’re showing off the latest prototype of their self-designed home safety device. It was inspired by knowledge widespread among firefighters but less known among ordinary folks that deaths from smoke inhalation, toxic and superheated gases and heat are effectively mitigated just by closing a door. UL has been trying to spread the word over the last few months following some studies showing the effectiveness of this simple countermeasure. LifeDoor is quite simple, really: The device, about the size of a paperback (now — future versions will be smaller), is installed in seconds by dropping it into the hinge of any ordinary door and attaching it to the door itself with screws or double-sided tape. The gadget is primed by opening the door, which works as normal, and then waits until it hears the distinctive, standardized 85 decibel tone of a triggered smoke alarm. If that happens, it pushes the door closed. It also lights up the room and sends out its own alarm in case someone didn’t hear the first one. It’s such a practical idea that Docksteader’s business partner, himself a firefighter in the Pacific Northwest, thought he could just go out and buy one — but instead found no such product exists, or at least not one that ordinary humans could install easily in their homes. So he and the team decided to make it. They’re totally self-funded, Docksteader said: “We called in every favor we could. Our biggest contributor was actually other firefighters.” They’re hoping to raise more money in the near future to cover manufacturing costs, but the design is nearly finalized and as far as I could tell from the demo, it worked like a charm. The team is well aware of the obvious worries. Could it slam on a kid or hand and hurt them? “We do tests where we put our fingers in the door — makes sense we should be the ones to take the risk,” Docksteader said. It has to be hard enough to close the door but no harder than that. Could a kid get trapped in a room when the door closes on them? The door doesn’t really take any more effort to open than normal, so any kid that can open it in the first place can get out, and any kid that can’t will be safer in an enclosed space. The battery should last 18-24 months if you’re testing your smoke detector regularly (which would of course shut all the doors equipped with the device), and they’re working on improving that. They’re also planning on Z-Wave smart home integration, which could in the future help provide other information, such as whether anyone’s in the room, where the fire started and so on. The plan is to ship in the fall, and pre-orders will open soon. As always with pre-orders, use your own discretion, but to me a handful of these would be a no-brainer if I owned a house. Sellinger told me firefighters love it, which is about all the recommendation you need. If you’re interested, you can get half off using CES2018 as a promo code — and no, they didn’t pay me to say that. If something as simple as closing a door could save a life and a fortune, I’m behind a gadget that does it for you.